“Saavi’s voice was cracking…his babbles started becoming of a deeper tone. My husband and I first believed that it was because he had a throat infection. But when I saw that he had developed pubic hair, I couldn’t believe my eyes. My maternal instincts told me something was wrong with my baby and that he needed a doctor fast”-Suvarna, mother of 3-year-old Saavi Sudanva. A little after he turned 2, Saavi’s parents started noticing unusual things about their toddler. But it all started with a simple problem; Saavi’s left leg looked weak and so his unassuming parents believed they should wait it out before going to a doctor. But soon, his voice lost its babyish quality. After this, when the 3-year-old toddler started getting pubic hair and even erections, they knew that they had to consult a doctor as soon as possible. “We did not understand what was happening. We were so ignorant at first that we thought that all this was happening because of his leg and consulted an orthopaedician. He told us that this is not a simple leg issue and told us to go to an endocrinologist. Many tests and scans later, he was found to have a 10 cm tumour above his kidneys. 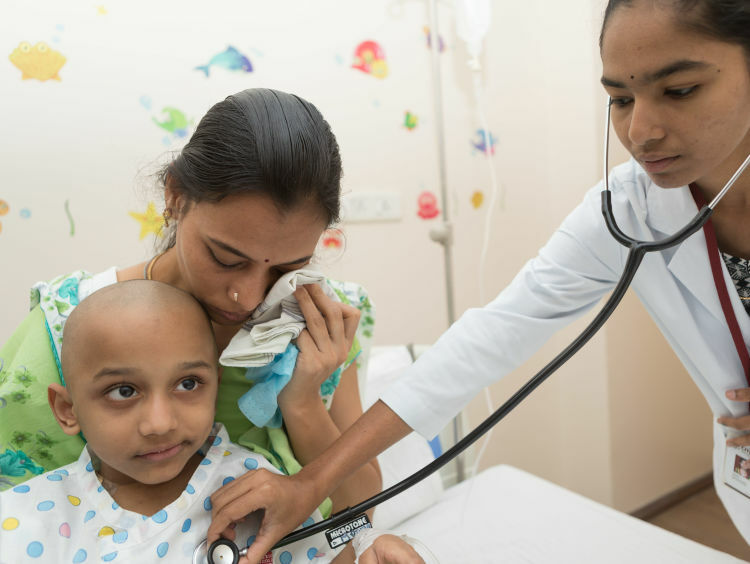 The doctors told us that the tumour secreted certain hormones, which was the reason Saavi got puberty-like changes in his body. It is a rare occurrence in children; but my poor Saavi had to fall prey to it”-Syam Sundar, father. “Saavi started crying a lot and demanding things that were not good for him. For example, he would ask for more and more food, despite eating to his stomach’s fill already. The tumour had made him more stubborn; he wouldn’t listen to us when we would tell him that eating a lot wasn’t good for his health. I had to stop myself from shouting at him badly in certain instances. I used to cry inside because I knew clearly that it wasn’t really his fault that he was acting so difficult.”-Suvarna. Within a month after he diagnosed, Saavi’s tumor was removed surgically because it was too dangerous to keep it inside the body for too long as it could spread to other organs and shut down his body function. His parents were relieved, but not for long. “We were completely devastated when the doctors told us that the tumour’s remnants are still active and that the cancer cells have a tendency to multiply. My son had lost his appetite altogether after the surgery. He didn’t want to play or even talk to us. He just sat gloomily all day in his hospital bed, like he knew that his body was failing him. I guess these are the most difficult days of my life, because I cannot bear to see my once-active son become so gloomy and dormant.”-Syam Sundar. 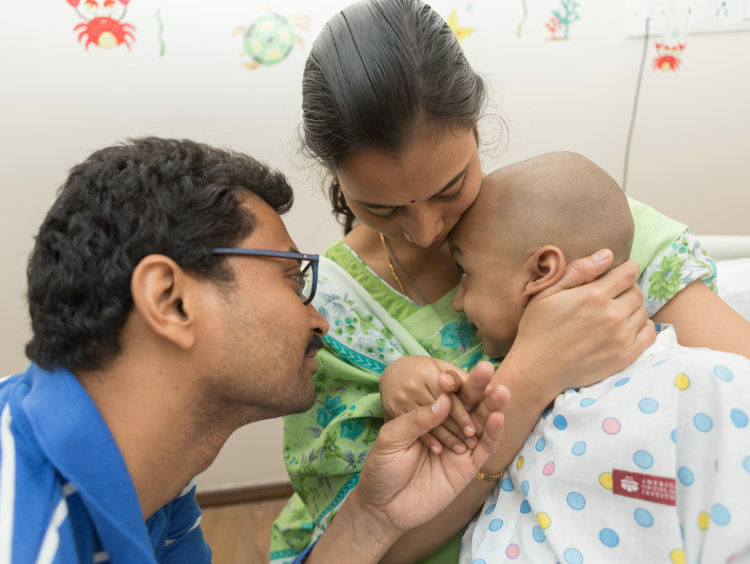 Without advanced treatment, Saavi’s tumor can turn fatal quickly. 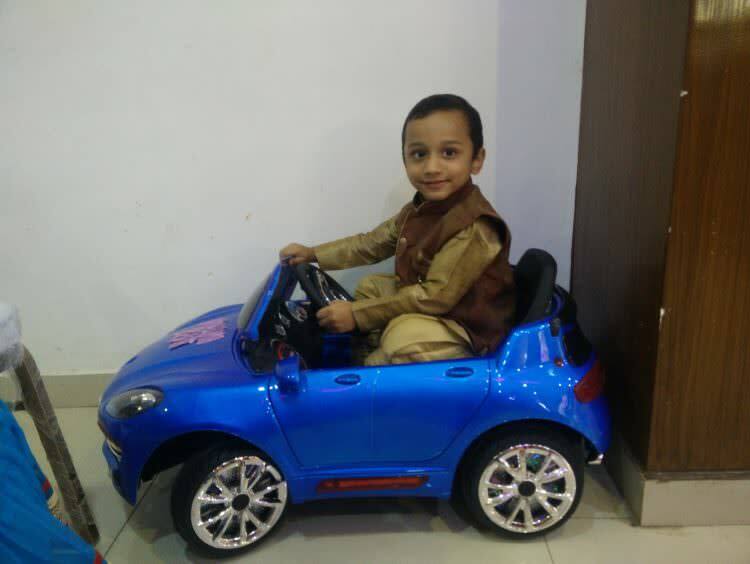 Syam, who works in a private company, believed that he could manage Saavi’s medical expenses because he had medical insurance covered for his entire family. 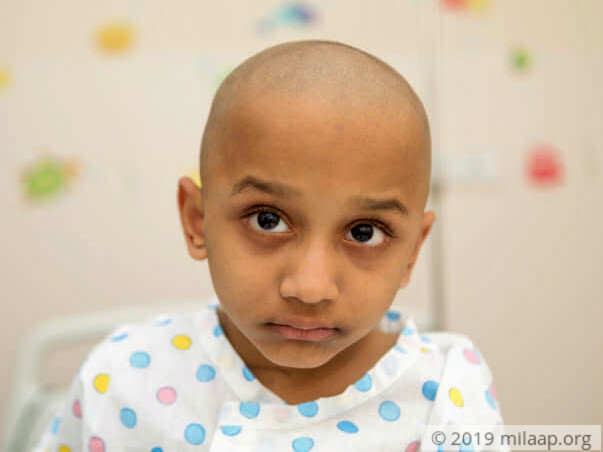 But expenses quickly spiraled out of control, and now Syam cannot understand how he will keep paying off the increasing hospital bills as Saavi’s tumor is believed to be rapidly growing, despite the surgery. “After what happened to my son, I have understood how unpredictable life can be. Despite having a decent job, I am scrambling for money to save my son because one is never prepared for tragedies like this that life just throws at you. 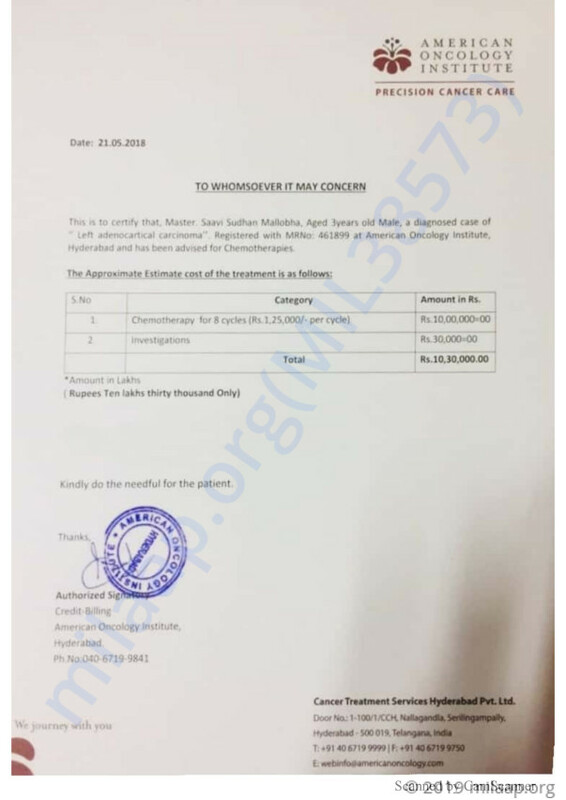 I have already spent about Rs 5 lakhs on his treatment, but given that it is very rare, his tumour may require advanced care apart from chemotherapy. I do not have any land or property that I can sell. This is a nightmare that may become a tragedy that my family cannot bear if we do not give him the best treatment possible. I need some help desperately.”-Syam Sundar pleads for his son's life.